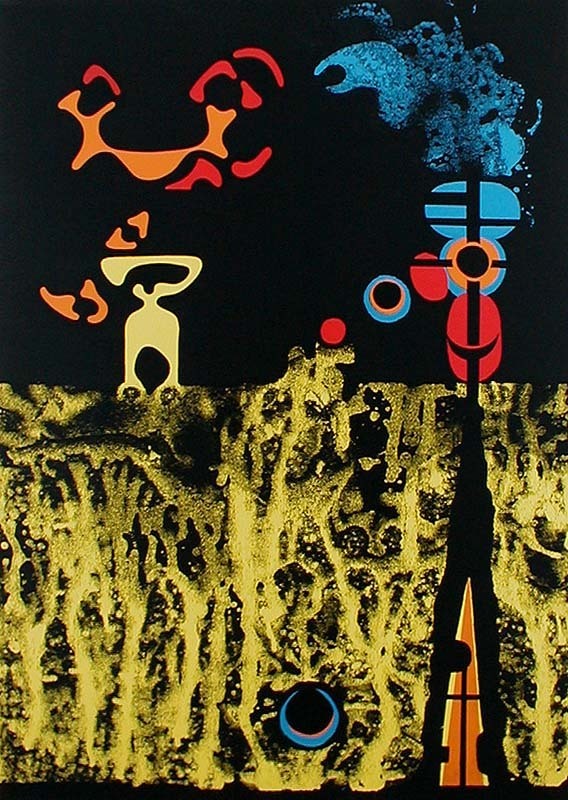 Robert Pearson McChesney (1913-2008) was a noted California abstract artist, a pioneer of the abstract expressionism (ab-ex) movement, and one of the leading figures of American Modernism. Robert “Mac” McChesney and his second wife, sculptor and author Mary Fuller McChesney, moved to Mexico in 1951 as a direct result of losing their jobs during the McCarthy era. They drove south in their Model A Ford mail truck and lived in Mexico for about a year, first in Ajijic and later in San Miguel de Allende. Shortly after their return to California, McChesney exhibited, alongside Ernest Alexander (former owner of the Scorpion Bar in Ajijic), Lenore Cetone and others, in the Annual Spring exhibit of Sausalito Art Center, held from 29 March to 12 April 1953. McChesney was born in Marshall, Missouri, on 16 January 1913. He attended Washington University in St. Louis (1931-34) and the Otis Art Institute in Los Angeles (1936). In 1937, he married one of his models, Frances, and they moved to San Francisco, where he was employed on the Federal Art Project. Together with 25 other artists, McChesney helped paint huge murals for the Golden Gate International Exposition (1939). During the 1940s he assisted Anton Refregier with murals in San Francisco’s Rincon Annex Post Office. During the second world war, McChesney worked as a merchant marine seaman, painting aboard ship in the South Pacific. After the war, he taught silk-screening (serigraphy) at the California School of Fine Arts (1949-51) and at Santa Rosa Junior College (from 1947 to 1958, with a year’s break in Mexico). He also taught at California State University, Hayward, from 1958 to 1962. McChesney married Mary Fuller in December 1949 and the couple lived in Ajijic and San Miguel de Allende in Mexico for a year, 1951-1952. Mary Fuller McChesney, best known as a sculptor, also wrote short stories, poems, art history articles and several detective novels using the pen name “Joe Rayter”, including Stab in the Dark, set in the 1950s Guadalajara art scene. On their return to California, they began to build their own home near the top of Sonoma Mountain in Petaluma, where they were still living at the time of Robert McChesney’s death on 10 May 2008. Robert McChesney held more than forty solo exhibitions during his long artistic career, including many in galleries and museums in San Francisco, as well as at the Art Institute of Chicago, Whitney Museum in New York, Sao Paulo in Brazil (1955), Oakland Museum, the Nevada Museum of Art (1994), and California State University, Fresno (1999). In 2009, a major retrospective of the work of both artists (Mac and his wife) was held at the Petaluma Arts Center. His work can be viewed in numerous museum collections such as the Whitney Museum of American Art in New York, the Art Institute of Chicago, Oakland Art Museum and the San Francisco Museum of Modern Art, California Palace of the Legion of Honor, Muskegon Museum of Art in Michigan, and Washington State Art Commission. Edan Hughes, Artists in California, 1786-1940. Smithsonian Institution. Oral history interview with Mary Fuller McChesney, 1994 Sept. 28, Archives of American Art, Smithsonian Institution.